TravelZIN: EuroDelays - compensation when your Flight is Delayed, Canceled or Overbooked. 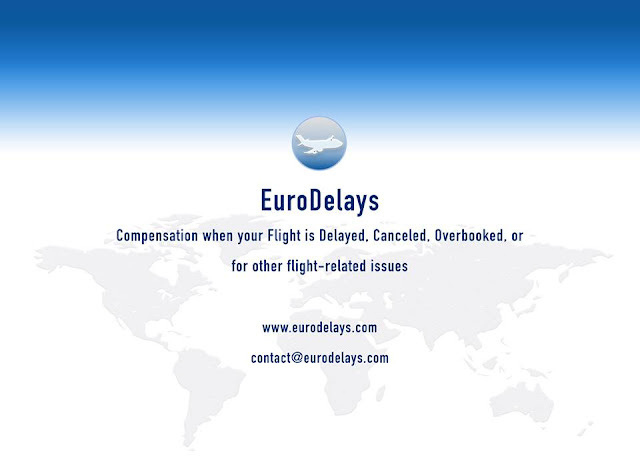 EuroDelays - compensation when your Flight is Delayed, Canceled or Overbooked. EuroDelays is your internet based aviation expert that assists air passengers whose flights were delayed, canceled or overbooked. I wish I knew them before. For example when my flight from Kuala Lumpur to Vienna had been overbooked and they forced me to fly with another company through Bangkok to Frankfurt which was far far away from my real destination. Or when arriving in Helsinki around midnight my connection flight was canceled and I had to spend an extra night at an airport instead of being with my family. Valeriy V. Sirotyuk is the founder and CEO of EuroDelays. He and his team members are very experienced aviation lawyers based in Chicago, Illinois dealing with both U.S. and international aspects of the aviation industry and customer protection laws. 1. In the first step, you send them your flight data. Based on your data they determine if your flight is eligible for compensation. 2. EuroDelays will take your case to airlines to get your compensation. If the airline refuses to pay, they will enforce your claim in the appropriate US or EU court at their expense (!). 3. You receive your compensation within 4-6 weeks. "Modern Aviation is the magic of our days: based on cutting-edge technologies, it provides jobs for millions and indispensable services to our global society. Notwithstanding its highest societal values, aviation is still a for-profit business. To maximize profits, an airline may try to apply "tricks" to avoid its compliance to different areas of aviation regulations. All airlines are obligated to compensate their passengers for various flight-related issues that might emerge. However, statistics show that each day, thousands of passengers are not compensated for issues such as flight delays, cancellations, or overbookings. I have created EuroDelays to protect your flight rights efficiently and professionally."